Nothing makes a parent feel prouder than receiving positive feedback about their child. 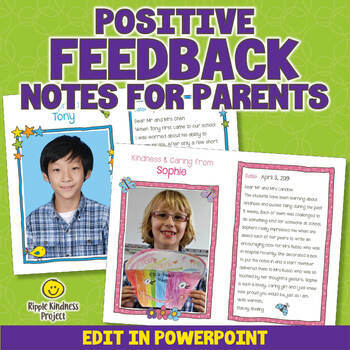 These editable feel-good notes about students can be a wonderful way of connecting parents and teachers, and may even improve relationships between parents and children. And a student who feels valued and noticed is likely to try harder to please. Teachers are busy and finding time to write personalised letters to parents is time consuming so these ready-made notes make communication a breeze. Simply select a style and color, pop in your photo, type your message and decorate with flowers, hearts, stars, birds and bugs. 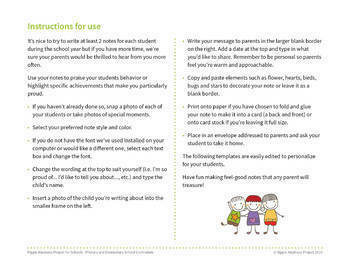 You've quickly and easily made a beautiful affirmation for students to take home to their parents. * You will need Microsoft Powerpoint 2007 or later - please contact me if you have an earlier version. ★ This resource complements our whole school, evidence-based SEL curriculum promoting kindness and mindfulness. Please check it out on our website. If you have any questions or ideas for other products you'd like to see in our store, we’d love to hear from you! Please email us at lisa@ripplekindness.org or find out more about what we do at www.ripplekindness.org. ★ Proceeds from sales on TPT help support disadvantaged school families via our outreach program Nourish Network. ★ Did you know you can save money on TPT resources by leaving feedback? You can receive credit towards future TpT purchases by reviewing products. If you like this one, please leave a review on the product page or through “My Purchases” under “My Account”. Your feedback is of great importance to us as it helps in determining which products are most valuable to you and your students. ★ Be the first to know about new products, freebies and discounts by becoming a follower. SImply click the green star next to our store logo to receive email updates.